Get the jigsaw mat to not only protect your floors, but also provide yourselves a comfortable workout area. It comes with edges to offer a finished look to your floor. The interlocking system of this exercise mat makes it easy to assemble it. This puzzle mats exercise equipment is firm enough to offer you a good support. Made from durable components, this fitness mat ensures a long-lasting performance. Moreover, it wouldn' t take much of your time to clean this mat. 1.We was established in 2002. Our competitive products are rubber foaming products, which made from rubber and plastic. 2.Our products: baby protector products, children safety toys and some NBR assembly parts. 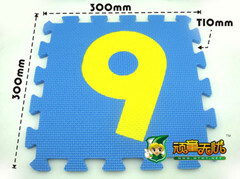 3.Our development Target is that to be a leader of foam toys to give kids good protector in funny playing. 4.Our foam NBR-PVC foaming products can be made according to customers' demands with 6P, CE, EACH, EN71, , MSDS, PAHS, REACH, ROHS certification.